Getting close to the end of the year often leads to looking ahead. Some people will look for the latest styles in fashion while others try to predict up-and-coming music stars that will break onto the charts. Information technology security has become a hot topic of discussion as people outside of the IT world become more and more aware of the potential problems and challenges facing businesses in today’s modern world. IT professionals and providers of managed IT services need to stay ahead of the latest trends to ensure that the people and businesses they support do not get left behind in 2019. With these trends in mind, businesses will be able to be better prepared for whatever the new year may hold. This year, the spotlight was put on data and how data is managed. Some serious data breaches made international news, Europe enacted wide sweeping data regulations, referred to as GDPR, and businesses experienced substantial losses due to malware like ransomware. While some of these situations are certainly not positive, the silver lining is that data protection and security have become top-of-mind as consumers and executives alike begin to take data more seriously. For businesses, managing and storing data will be a big emphasis for 2019. In this modern, connected world, businesses take in, handle, and store more data than ever before. New regulations may affect how that data is to be handled and new threats to data security should spur businesses into reviewing policies and making changes if needed. The cloud, as far as major technology advances go, is not exactly something new and shiny for most people. Users with smartphones use the cloud every day to save photos and app data, for example. However, cloud-based storage and technology is just beginning to realize their potential as more and more services become available on the cloud for businesses to use. Of course, with new services come a whole host of concerns including compliance, security, and integration. In 2019, everything from data storage to customer relationship management to malware protection will be done from the cloud. Of course, the job for managed network services providers will be to ensure that all of this technology meets the needs of the business, complies with security best practices, and integrates into the businesses’ workflow. This isn’t to make cloud-based services sound scary. In fact, they should be embraced. Cloud technology enables users to be more efficient, reduce waste, and gain mobility as they use modern tools to get their work done. However, cloud services need to be implemented thoughtfully and with data protection always top-of-mind. The internet of things is very exciting for the future of business, but it can also be a point of vulnerability. As smart lights, smart thermostats, and other smart devices are added to offices, hackers will see new potential points to exploit and attack. One of the most pressing matters for IT security professionals will be how to enable these devices while maintaining network security. Of course, one of the most basic methods of preventing cyber attacks is to simply update software and firmware as it is released. However, with potentially hundreds of connected devices within the walls of a typical office, managing those devices will become a much more intensive task. Taking stock of connected devices and staying aware of security updates will be incredibly important throughout 2019 and beyond. Technology is moving fast and business networks are going to be relied on more than ever. Staying ahead of trends in the technology and business worlds is not an easy task, but IT security should be a top priority for every business of every size this coming year. The team at Smile Business Products has years of experience providing professional managed network services. Their experienced team can help businesses embrace the future while also protecting themselves from the challenges that may come with new technologies and trends. 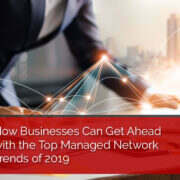 To learn more about managed network services and other managed network trends for 2019, contact Smile Business Products today.